SimpleMD protein bars are made with extra virgin olive oil and red wine, the two key elements of the most healthful eating regimen: the Mediterranean Diet. 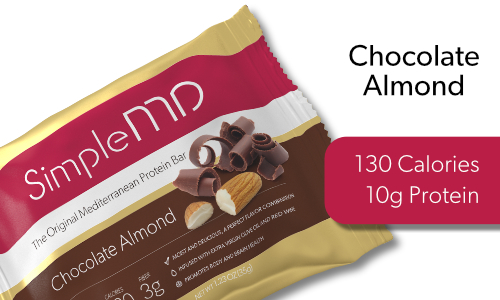 Discover Chocolate Almond, Caffe Latte, and Chocolate Date from SimpleMD. The only bars made with extra virgin olive oil and red wine; helping you become a better you without sacrificing taste or nutrition. Today there are millions of people following the Mediterranean Diet as a way to improve their health and wellness. And now there is a protein bar aligned with everything the Mediterranean Diet has to offer. SimpleMD bars taste great, are high in protein, and are made with the two most essential elements of the Mediterranean Diet: extra virgin olive oil and red wine. As part of the Mediterranean Diet, these ingredients have been proven to increase longevity, and reduce the risk of a range of diseases including breast cancer, Alzheimer's, age-related macular degeneration, and arthritis. When combined with other ingredients such as chocolate, almonds, coffee, or dates, the result is a protein bar that tastes so good, it's simply hard to believe that it's good for you too. CAN'T DECIDE? TRY A SAMPLER! Extra virgin olive oil and red wine are the heroes of the Mediterranean Diet and the foundation of SimpleMD, the only protein bars made with these ingredients. Enjoy! Our SimpleMD protein bars put the Mediterranean Diet in the palm of your hand. Three delicious flavors, all under 140 calories and packed with protein. Enjoy! The Mediterranean Diet delivers many health benefits, perhaps none more significant than helping prevent breast cancer. Help support our cause.